Andersen’s mark on the literary world is evident, and the fairy tale category of his oeuvre is impressive; Anderson published 168 fairy tales between 1835 and 1872. Likewise, the staggering number of illustrations and translations (both professional and amateur) produced since then are a testament to Andersen’s strengths as a storyteller. Hans Christian Andersen’s fairy tale “The Little Match-girl” began unconventionally. Typically, authors commission illustrators after completing their texts; however, for “The Little Match-girl,” this process was reversed. Publishers approached Andersen with woodcuts by illustrator Johan Thomas Lundbye and solicited a story based on the one Andersen found most intriguing. The image of a melancholy girl, barefoot and wandering a cobbled street quickly arrested him. In The Annotated Hans Christian Andersen (TAHCA), editor Maria Tatar notes that below Lundbye’s beleaguered girl appeared the phrase: “Do good when you give.” TAHCA also includes a transcription of Andersen’s emotional and introspective reaction to the image: “‘While I was at [an opulent manor in Denmark],’ Andersen later recalled in his travel diaries, ‘in this time of luxury and plenty, a publisher sent three woodcuts asking me to pick one and write a little story around it. I chose a scene that depicted poverty and deprivation, a ragged little girl with a handful of matches—‘The Little Match-girl’—the contrast between our life at Augustenborg and her world.’” His humility and empathy are poignant, especially for those of us today who live in the midst of plenty. “The Little Match-girl” (Danish: “Den Lille Pige med Svovlstikkerne”) debuted in Dansk Folkekalender for 1846 (Danish Folk Calendar for 1846); the publishers who contacted Anderson with Lundbye’s woodcuts commissioned several stories to give their calendar more appeal. Regarding the story’s first publication in book form, “The Little Match Girl” was first found in 1848’s Nye Eventyr (New Fairy-Tales) and soon thereafter in 1850’s Eventyr (Fairy-Tales). 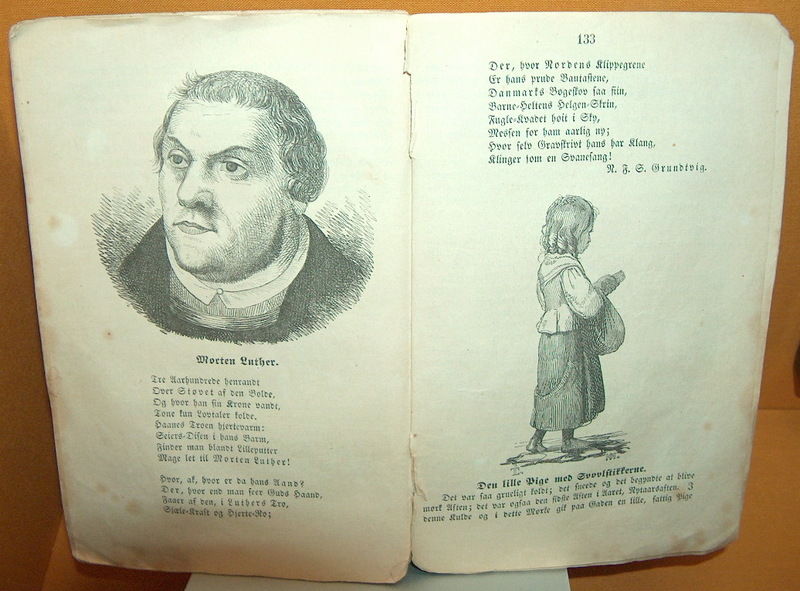 The last Danish publication during Andersen’s lifetime came in the March 1863 Eventyr og Historier (Fairy Tales and Stories). I own a 1942 edition of Andersen’s Fairy Tales, translated by the same Jean Hersholt mentioned above and illustrated by Fritz Kredel. 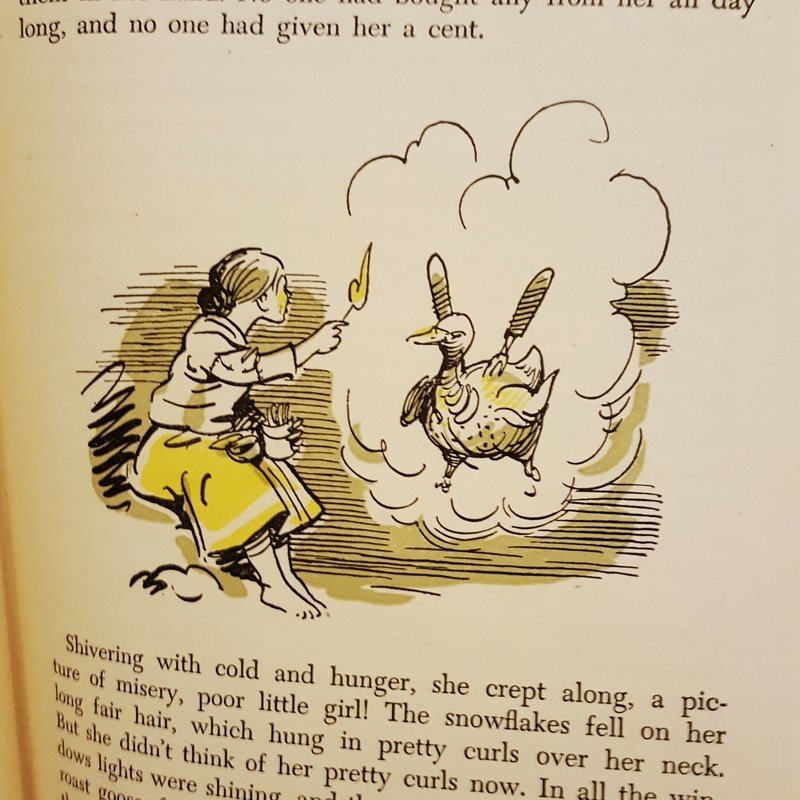 There’s only one image of the little match-girl; it portrays the delicious roast goose she fantasizes about while lighting those few remaining matches in an attempt to keep herself warm. It’s been an absolute pleasure learning about the provenance and publication of “The Little Match-girl” in preparation for the little match girl passion. While most composers usually provide musicians with performance notes to inform their performances, the little match girl passion has required a more investigative approach for The Valley 7. Practicing and polishing Lang’s epic piece has been an unforgettable experience, but truly immersing ourselves in the nuance, the depth, and the history of this text’s composition has been equally rewarding. Andersen's "The Little Match Girl"
Throughout my childhood, my sister and I, like most children, looked forward to Christmas with a special fervor. We had many traditions, but there was one in particular that continued through our adolescence and into adulthood. Each year, our mother and maternal grandmother would buy a new Christmas book. Some were classic Santa tales, some told the story of Jesus’ birth, some were beautifully illustrated, and some were simple. One year, when visiting my grandmother up in Ohio, during the grandchildren’s annual energetic demolition of wrapping paper and presents, my sister and I received a unique book. It was an illustrated copy of Hans Christian Andersen's “The Little Match Girl.” Although not technically a Christmas story, my family came to associate this story with the holiday season, and it quickly became one of my favorite Christmas books. After reading this description, you might be wondering how a young girl of 7 or 8 could come to love this story. It is unusual, I admit. I remember first loving the book purely for the gorgeous illustrations by Rachel Isadora, but as I got older, the book held different meaning for me. Of course I did not have the knowledge, emotional maturity, or desire to fully analyze why I loved this story in my youth, but revisiting this text through The Valley 7’s study of this work has encouraged me to do so. Was it for a religious reason? The idea of life beyond death? The counterintuitive idea of happiness in death? Perhaps this is a simple answer, but I believe that I came to love this story because it describes how hope and memories have the power to influence the beauty we see in the world. I am not an expert in analyzing Andersen’s intent; it is more probable that this was a religious tale describing the promise of heaven. However, I see God’s gift of hope as the greatest promise, how a small girl in the cold of night does not suffer, because she is warmed by her hopes and dreams, until finally, she is at peace. The first two seasons of The Valley 7 have been about finding our voice through exploring repertoire possibilities. We began our first season with renaissance choral music, an obvious fit for a chamber vocal ensemble. Since then we’ve begun to stretch our repertoire with forays into folk music, world music, holiday literature, americana, and now contemporary music. 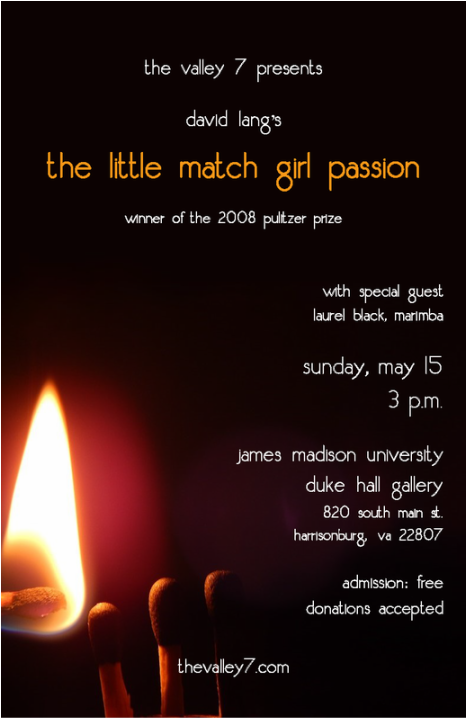 I first heard about the little match girl passion (tlmgp) from a former student of mine who had recently performed the work with an ensemble at Westminster Choir College in 2013. I began to study the work, first in its more common voicing for SATB choir, SATB quartet, and percussion. When I discovered that the work was originally written for four voices with percussion I began to be excited at the possibility of The Valley 7 being able to perform this. Lang appreciates Christianity’s huge influence of the development of Western music. He recognizes that Bach’s liturgical music is moving, in part, because it so clearly expresses the composer’s deep faith. But a disconnect remains. ”For many people like me,” said Lang, “who are not Christians but who have really deep classical music roots, we often come to these moments. . .There’s a limit to how deeply into this world we can go, because we don’t believe in Jesus. It’s a weird kind of no man’s land for people like me.” With the Little Match Girl Passion, Lang decided to face that no man’s land head on. Bach’s St. Matthew Passion was his starting point. ​The Lang has presented The Valley 7 with new challenges in our brief history. The work is less about beautiful arching phrases, matching vowel color, or consistent intonation as our forays into Tallis or Messiaen require. Tlmgp is far more about becoming powerfully rhythmic performers, and learning how to utilize the voice in a minimalist setting. Singing the same melodic phrase over several minutes presents interesting challenges in maintaining vocal health and utilizing the mechanism in a consistent way. In addition to the technical challenges, tlmgp has encouraged us to grow as collaborative musicians. The nuanced listening this work calls for requires each member of the ensemble to be consistently in tune with each other, in a way far beyond typical choral music. Not to mention that we all are learning how to be percussionists! We are very much enjoying learning more about ourselves and our process through the Lang. We look forward to bringing this work to you on May 15. This Spring, The Valley 7 have been feverishly working on David Lang's little match girl passion, winner of the 2008 Pulitzer Prize for Music. We can't wait to perform this haunting setting of the Hans Christian Anderson tale on Sunday, May 15, at 3pm at JMU's Duke Hall Gallery of Fine Art. David Lang's page about "the little match girl passion"